"Basketball Hall of Fame" redirects here. For other uses, see Basketball Hall of Fame (disambiguation). 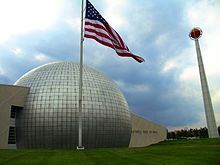 The Naismith Memorial Basketball Hall of Fame is an American history museum and hall of fame, located at 1000 Hall of Fame Avenue in Springfield, Massachusetts. It serves as the sport's most complete library, in addition to promoting and preserving the history of basketball. Dedicated to Canadian-American physician and inventor of the sport James Naismith, it was opened and inducted its first class in 1959. As of the induction of the Class of 2018, the Hall has formally inducted 389 individuals. The Naismith Hall of Fame was established in 1959 by Lee Williams, a former athletic director at Colby College. In the 1960s, the Basketball Hall of Fame struggled to raise enough money for the construction of its first facility. However, during the following half-decade the necessary amount was raised, and the building opened on Feb. 17, 1968, less than one month after the National Basketball Association played its 18th All-Star Game. The Basketball Hall of Fame's Board named four inductees in its first year. In addition to honoring those who contributed to basketball, the Hall of Fame sought to make contributions of its own. In 1979, the Hall of Fame sponsored the Tip-Off Classic, a pre-season college basketball exhibition. This Tip-Off Classic has been the start to the college basketball season ever since, and although it does not always take place in Springfield, Massachusetts, generally it returns every few years. In the 17 years that the original Basketball Hall of Fame operated at Springfield College, it drew more than 630,000 visitors. The popularity of the Basketball Hall of Fame necessitated that a new facility be constructed, and in 1985, an $11 million facility was built beside the scenic Connecticut River in Springfield. As the new hall opened, it also recognized women for the first time, with inductees such as Senda Berenson Abbott, who first introduced basketball to women at Smith College. During the years following its construction, the Basketball Hall of Fame's second facility drew far more visitors than ever anticipated, due in large part to the increasing popularity of the game but also to the scenic location beside the river and the second Hall's interesting modern architecture. In 2002, the Basketball Hall of Fame moved again—albeit merely 100 yards south along Springfield's riverfront—into a $47 million facility designed by renowned architects Gwathmey Siegel & Associates. The building's architecture features a metallic silver, basketball-shaped sphere flanked by two similarly symmetrical rhombuses. The dome is illuminated at night and features 80,000 square foot (7,400 m²), including numerous restaurants and an extensive gift shop. The second Basketball Hall of Fame was not torn down but rather converted into an LA Fitness health clubs. The current Basketball Hall of Fame features Center Court, a full-sized basketball court on which visitors can play. Inside the building there are a game gallery, many interactive exhibits, several theaters, and an honor ring of inductees. A large theater for ceremonies seats up to 300. The honorees inducted in 2002 included the Harlem Globetrotters and Magic Johnson, a five-time NBA champion, three-time NBA finals MVP and Olympic gold medalist. As of 2011, the current Basketball Hall of Fame has greatly exceeded attendance expectations, with basketball fans traveling to the Hall of Fame from all over the world. Despite the new facility's success, a logistical problem remains for the Basketball Hall of Fame and the City of Springfield. The two entities (along with the riverfront area entirely) are separated by the Interstate 91 elevated highway—one of the eastern United States' busiest highways—which, essentially, inhibits foot-traffic and other interaction between the Basketball Hall of Fame and Springfield's increasingly lively Metro Center. Both the Hall and Springfield have made public statements about cooperating further so as to facilitate even more business and recreational growth for both; however the placement and height of Interstate 91 remain physical obstacles. Urban planners at universities such as UMass Amherst have called for the I-91 to be moved, or to be re-configured so as to be pedestrian-friendly to Hall of Fame visitors. In 2010, the Urban Land Institute announced a plan to make the walk between Springfield's Metro Center and the Hall of Fame (and riverfront) easier. Veterans Screening Committee (7 members), with "Veterans" defined as individuals whose careers ended at least 35 years before they are considered for election. Since 2011, the Veterans and International Committees also vote to directly induct one candidate for each induction class. American Basketball Association Committee - This committee was permanently disbanded in 2015 because it had fulfilled its purpose over the previous five years. Other committees may choose to elect contributors. For example, the 2014 class included two contributors. To be considered for induction by a screening committee, a player, retired coach, or referee must be fully retired from that role for at least three full seasons. The waiting period had originally been five years, but was changed to four years in December 2015, and to three seasons in December 2017. Prior to the induction class of 2018, referees had been eligible for induction after 25 years of full-time service, even if still active. Changes to the criteria for consideration of active coaches were also announced as part of the 2017 changes. Currently, coaches become eligible upon 25 years of full-time service at the high school level or above, or three seasons after retirement. Effective with the class of 2020, active coaches must meet the years of service requirement and be at least 60 years old. No years of service criterion is required for those who have made a "significant contribution to the game of basketball". Sportswriters and commentators are elected as full-fledged members, in contrast to the Baseball Hall of Fame that places them in separate wings from the "real" Hall of Fame. Controversy has arisen over aspects of the Hall's voting procedures, including voter anonymity. While sportswriter voters of other major sports' Halls of Fame openly debate their choices, the Naismith Hall process is not transparent. The Hall has also been criticized for a tendency to enshrine active collegiate coaches and relatively obscure players while omitting some accomplished players and coaches. Since 1959, 395 coaches, players, referees, contributors, and teams have been inducted, with the most recent class entering on September 8, 2018. John Wooden, Lenny Wilkens, Bill Sharman, and Tom Heinsohn have each been inducted as both player and coach (Wooden in 1960 and 1973, Sharman in 1976 and 2004, Wilkens in 1989 and 1998, and Heinsohn in 1986 and 2015). John McLendon has been inducted as both coach and contributor, entering in 1979 as a contributor and 2016 as a coach. On three occasions, the Hall has inducted new classes without honoring a player – 1965, 1968, and 2007. For men, the Hall presents awards to the top players in Division I at each of the five standard basketball positions. The Bob Cousy Award, presented since 2004 to the top point guard. The award was originally open to players in all three NCAA divisions (I, II, and III), but is now restricted to D-I players. The Jerry West Award, presented since 2015 to the top shooting guard. The Julius Erving Award, presented since 2015 to the top small forward. The Karl Malone Award, presented since 2015 to the top power forward. The Kareem Abdul-Jabbar Award, presented since 2015 to the top center. Each of the award winners is chosen by a Hall of Fame selection committee, plus the award's namesake. The Hall, in cooperation with the Women's Basketball Coaches Association, presents analogous awards for the top Division I women's players at each position. One has been awarded since 2000; the others were first presented in 2018. The Nancy Lieberman Award for the top point guard was the Hall's only women's positional award that was presented before 2018, having first been awarded in 2000. The Ann Meyers Drysdale Award, first presented in 2018 to the top shooting guard. The Cheryl Miller Award, first presented in 2018 to the top small forward. The Katrina McClain Award, first presented in 2018 to the top power forward. The Lisa Leslie Award, first presented in 2018 to the top center. As with the men's awards, the selection committee for the women's awards includes each award's namesake. The Hall also formerly presented the Frances Pomeroy Naismith Award to two college seniors—one male player no taller than 72 inches (1.83 m), and one female player no taller than 68 inches (1.73 m)—determined to have been the nation's best student-athletes. The men's award, given since 1969, was voted on by the National Association of Basketball Coaches (NABC), and the women's, given since 1984, by members of the Women's Basketball Coaches Association. Both awards were discontinued after the 2012–13 season. ^ "Where is the national basketball Hall of Fame located? - The Basketball Fans". The Basketball Fans. 2018-10-16. Retrieved 2018-11-28. ^ Caroline Thompson (2015-10-14). "The History of Basketball in the 1930s". Livestrong.Com. Retrieved 2016-03-31. ^ "Naismith Memorial Basketball Hall of Fame Announces 12 Finalists for 2011 Election" (Press release). Naismith Memorial Basketball Hall of Fame. February 18, 2011. Archived from the original on February 22, 2011. Retrieved February 18, 2011. ^ a b c "Guidelines For Nomination and Election Into the Naismith Memorial Basketball Hall of Fame". Naismith Memorial Basketball Hall of Fame. Archived from the original on September 4, 2009. Retrieved February 18, 2011. ^ a b "Naismith Memorial Basketball Hall of Fame Announces 12 Finalists for 2013 Election" (Press release). Naismith Memorial Basketball Hall of Fame. February 15, 2013. Archived from the original on February 18, 2013. Retrieved February 25, 2013. ^ "Hall of Fame Announces Modifications to its Enshrinement Process". Naismith Memorial Basketball Hall of Fame. December 14, 2015. Archived from the original on 25 December 2015. Retrieved 24 December 2015. ^ a b c "Naismith Memorial Basketball Hall of Fame Announces Modifications to its Enshrinement Process Beginning with the Class of 2018" (Press release). Naismith Memorial Basketball Hall of Fame. December 19, 2017. Retrieved February 17, 2018. ^ a b c "Guidelines For Nomination and Election". Naismith Memorial Basketball Hall of Fame. Archived from the original on 4 September 2009. Retrieved 24 December 2015. ^ Aschburner, Steve. "Hall of Fame selection process leaves much to be desired". Archived from the original on 8 April 2014. ^ Ziller, Tom (30 March 2010). "Fans to Vote for Basketball Hall of Fame Inductees". AOL News. Archived from the original on 12 February 2011. Retrieved 11 May 2013. ^ "Naismith Memorial Basketball Hall of Fame Announces Class of 2013" (Press release). Naismith Memorial Basketball Hall of Fame. April 8, 2013. Archived from the original on April 12, 2013. Retrieved September 9, 2013. ^ espn.go.com, Mutombo, Johnson, Calipari Among HOF Nominees, accessed February 14, 2015. ^ Johnson, Claude (September 8, 2016). "Basketball legend 'Coach Mac,' John McLendon, finally in Hall of Fame as coach". The Undefeated. Retrieved March 31, 2018. ^ "Naismith Memorial Basketball Hall of Fame Narrows Watch List for 2018 Bob Cousy Award" (Press release). Naismith Memorial Basketball Hall of Fame. February 5, 2018. Retrieved February 18, 2018. ^ "Naismith Memorial Basketball Hall of Fame Narrows Watch List for 2018 Jerry West Award" (Press release). Naismith Memorial Basketball Hall of Fame. February 6, 2018. Retrieved February 18, 2018. ^ "Naismith Memorial Basketball Hall of Fame Narrows Watch List for 2018 Julius Erving Award" (Press release). Naismith Memorial Basketball Hall of Fame. February 7, 2018. Retrieved February 18, 2018. ^ "Naismith Memorial Basketball Hall of Fame Narrows Watch List for 2018 Karl Malone Award" (Press release). Naismith Memorial Basketball Hall of Fame. February 8, 2018. Retrieved February 18, 2018. ^ "Naismith Memorial Basketball Hall of Fame Narrows Watch List for 2018 Kareem Abdul-Jabbar Award" (Press release). Naismith Memorial Basketball Hall of Fame. February 6, 2018. Retrieved February 18, 2018. ^ "Naismith Memorial Basketball Hall of Fame, Women's Basketball Coaches Association Narrow Watch List for 2018 Nancy Lieberman Award" (Press release). Naismith Memorial Basketball Hall of Fame. January 29, 2018. Retrieved February 18, 2018. ^ "Naismith Memorial Basketball Hall of Fame, Women's Basketball Coaches Association Narrow Watch List for 2018 Ann Meyers Drysdale Award" (Press release). Naismith Memorial Basketball Hall of Fame. January 30, 2018. Retrieved February 18, 2018. ^ "Naismith Memorial Basketball Hall of Fame, Women's Basketball Coaches Association Narrow Watch List for 2018 Cheryl Miller Award" (Press release). Naismith Memorial Basketball Hall of Fame. January 31, 2018. Retrieved February 18, 2018. ^ "Naismith Memorial Basketball Hall of Fame, Women's Basketball Coaches Association Narrow Watch List for 2018 Katrina McClain Award" (Press release). Naismith Memorial Basketball Hall of Fame. February 1, 2018. Retrieved February 18, 2018. ^ "Naismith Memorial Basketball Hall of Fame, Women's Basketball Coaches Association Narrow Watch List for 2018 Lisa Leslie Award" (Press release). Naismith Memorial Basketball Hall of Fame. February 2, 2018. Retrieved February 18, 2018. Wikimedia Commons has media related to Naismith Memorial Basketball Hall of Fame building.